on board the marmalade truck? Spotted in an empty store window in Portland a couple of weekends ago. 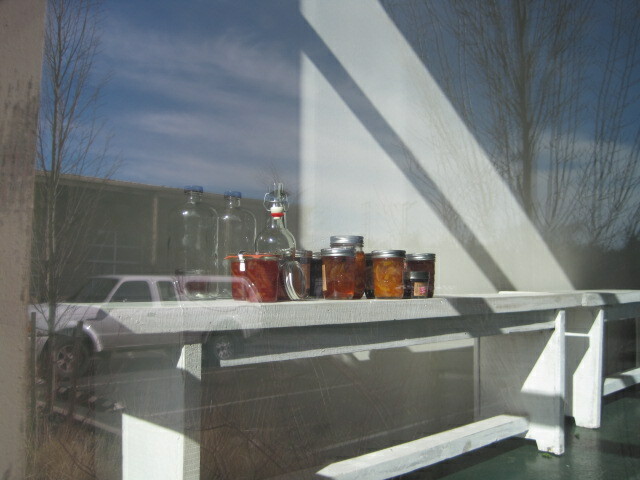 For the record, I made my own marmalade once, by special request, with citrus I trucked up from the Bay Area. (Keepin’ it local, yo.) And once was enough for me. So save me a seat on the marmalade truck! I spent the day making dark foods, surely the monstrous calling yoo-hoo from some creepy corner of my subconscious. First: a jam emergency sent me to the freezer for the rest of the 2010 berries: Chester blackberries, blueberries, and some boysenberry-rose geranium coulis for good measure. And thus was this year’s Black & Blue Willamette jam born. Next, I turned to the squashes I had hacked into pieces yesterday. 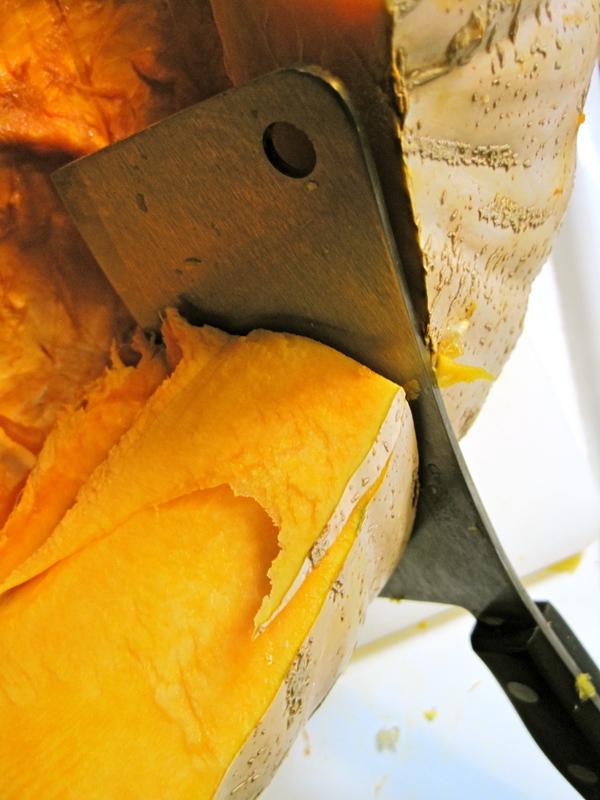 If you’ve ever tussled with an Oregon Homestead Sweetmeat squash, you will understand the monumental work this entails. I roasted some chunks, tried to shove some off on my neighbor (unsuccessfully), and sweated the rest for soup. As the soup bubbled, bubbled, toil-and-troubled away on the stove, I turned my attention to a pot roast, which ended its life with a wonderful mahogany crust and dark, winey gravy punched up with lemon zest and sherry vinegar. Since Retrogrouch still isn’t eating potatoes, I had to explain that there was poison in the roasted root melange (i.e. potatoes mingling among the non-poison turnips and rutabagas). Caveat maritus! Hi! I missed y’all. It’s been a tough week here at Culinaria Eugenius headquarters, where the CEO/Director of Floor Scrubbing is kind of tapped out with all the conferencing and eventing and dinnering. I’m taking the weekend to just stay at home and regroup. On those personality tests that were so popular a few years ago, I always score right around 50/50 for introversion and extroversion, and I’ve been operating at about 110% extroversion lately, so that’s why you see me around town all lopsided and half-baked. It’s been a transformative and stimulating month, but I missing my domestic quietude, not to mention the ever-growing pile of papers to grade and books to read and essays to write. But for those of you who are hungry for more events — and you should be, because we’re riding a wave of excellent food lectures in Eugene — check out an film/lecture series TOMORROW – 2/27! featuring some involvement by fellow Eugene local food/garden bloggers, Squash Practice. 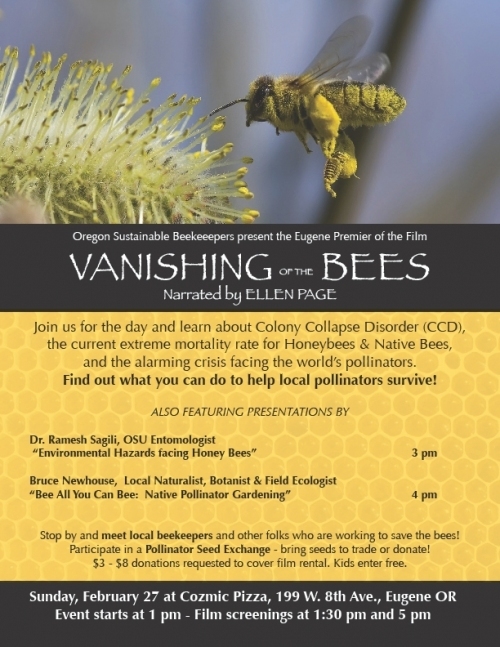 It’s a daylong exploration of a very serious issue — the vanishing of the bees in North America, thanks to Colony Collapse Disorder. In short: no bees = no pollination = no fruit = no seeds = no plants = death of planet. There will be two showings of the film, two lectures, and a seed exchange, all held at Cozmic Pizza. See more details by clicking the poster. Gary and his wife Ellen are great proponents of sustainable agriculture, and thanks to Gary’s engineering background, they not only save seeds but experiment with cross-pollination and genetic engineering (in a non-evil GMO way!). You can read more about Gary’s beekeeping practices in one of his many well-researched posts. A real food recipe-style post is coming up soon, I promise. I have a backlog of photos and experiences to share! We’re live! Great keynote this morning. Check out live tweets of the Food Justice conference by Suzi Steffen’s UO Journalism class by following this link. The official Food Justice conference twitter feed can also be viewed here. And don’t forget to listen to the interview with Darra Goldstein of Gastronomica magazine (either live 12-1 pm. today, Sunday 2/20, or in the postcast later) on KLCC’s Food for Thought! This just in from the Food Justice Conference folks. The conference starts today and extends through Monday. On the UO campus, fresh, wild, and free to all! The Food Justice: Community, Equity and Sustainability conference, sponsored by the Wayne Morse Center, is taking place this weekend. If you aren’t planning on attending, you can still participate by watching two of the events live online. Frederick Kirschenmann’s opening address, titled “Food security in a changing world: Expanding the vision of sustainable agriculture,” begins at 4 p.m. on Saturday. Dr. Vandana Shiva’s closing address, titled “Food & seed sovereignty: Creating a people’s food system,” begins at 5:30 p.m. on Monday. Both events will be available to watch via this link. Note: nothing is there now, but the video feed will show up 10-15 minutes before each event begins. Other Food Justice events will be either videotaped or audio recorded and will be available on the Food Justice conference website in the near future. Happy Valentine’s Day. Hope yours was fine and dandy, like sweet sugar candy. Yes, I’m channeling my Great Uncle Edziu. Be thankful I’m not taking you for a polka around the room and squeezing you so tight my hearing aid squeals against your ear. 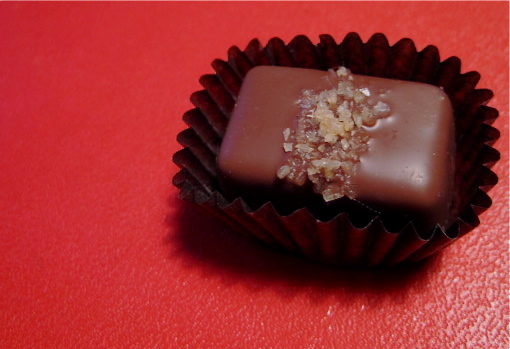 Have a smoked salt caramel instead.